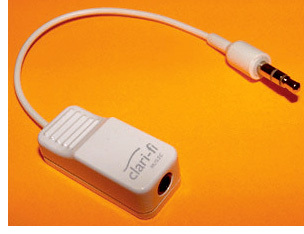 Clari-Fi Headphone Adapter 'Cleans' Your MP3s | OhGizmo! The Clari-Fi is a small adapter designed to sit between your MP3 player and your headphones that will supposedly clean out any digital artifacts from your compressed sound files. Their website claims that by removing these artifacts you’re left with clearer, more natural sound, that is also less likely to damage your hearing. The device actually uses a small bit of circuitry which draws power from the headphone jack, so it’s not just a case of it being some high-end, super-expensive cable. And while I admit I haven’t actually tried the Clari-Fi for myself, the words snake & oil do come to mind. Maybe some PR-talk about the technology behind the device will convince me of its usefulness. At the heart of the clari-fi is a proprietary semiconductor technology developed over the past three years in San Jose, CA using custom Silicon. This technology allows for real-time compression of digital audio, removing harmful digital artifacts and ‘spikey-ness,’ while retaining the music’s original acoustic tonal quality, and improving its clarity and richness. Nope, still not convinced. But if you’re willing to give them the benefit of the doubt, the company actually sells two versions specifically tweaked for listening to music or podcasts. The Clari-Fi Music sells for $59.95, while the Clari-Fi Podcast sells for $49.95. Oooh! Custom silicone. I hate that fake non-designer silicone. You do realize that what comes out of the earphone port is analog, right? Apparently this is just an audio compressor, not compression as in a zip file, but as in the audio term. A simple way of explaining this is that if the sound were a picture, it would lower the contrast. I suppose their logic is that loud noises will hurt you, so the loud noises should be brought down to the same volume and the quiet ones. not really much point in that as it totally degrades the sound quality! I suppose it could be useful for a podcast or talk radio if the recording was done especially badly and the volumes are too different. Qender you are right about what a compressor is, but this works in a way that is more sophisticated than what you described. It allows ‘good’ high frequencies to be heard, but compresses highs that are peaking. The overall sound quality isn’t degraded, it’s actually improved. I’d love to know how they get the DC power required to feed their device when 3.5″ jack sockets do not provide any level of DC and the power output is usually less than 100mW. One suspects that it’s not electronic but just a passive low pass filter. That’s a 99p capacitor and resistor mate.